Jamie Crone's 25th goal of the season gave Little Common a precious 1-0 win away to Seaford Town. 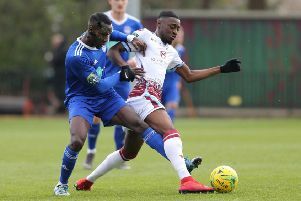 Little Common Football Club moved to within three points of the league title with a hard-fought but scrappy 1-0 win at Seaford Town yesterday (Saturday). A solitary Jamie Crone goal and yet another clean sheet earned Common their ninth successive Macron Store Southern Combination League Division One victory. The Commoners made one change to their starting line-up, with Harry Saville coming in to replace Adam Smith. Common edged the opening exchanges and enjoyed the majority of possession without really troubling the Seaford goal, Wes Tate saw an effort flash wide, while Sam Ellis saw an effort comfortably saved by the home stopper at his near post. Seaford grew in confidence and came into the game more as the first half went on, enjoying a good spell of pressure of their own. A lobbed effort drifted wide before Common goalkeeper Matt Cruttwell saw an attempted clearance rebound off the Town striker behind for a goal kick. The Commoners were somewhat frustrated by their hard-working hosts, but did see a goalbound Russell Eldridge free kick blocked before a Ryan Paul delivery across the box eluded Ellis at the far post. Seaford’s best chance of the afternoon came just after the interval when the ball was pulled back from the touchline to an onrushing striker, but his first time effort cleared the crossbar. Common began to play with more urgency as they looked for the vital breakthrough. Lewis Hole was denied by a fine near post save from a header and then Saville saw an effort from the edge of the area clear the crossbar. The turning point in the match appeared to arrive after 75 minutes when Seaford were reduced to 10 men following a late lunge on Lewis Parsons, who played for the club several years ago. One minute later the Commoners were ahead. A delivery into the box was lofted into the air by a Town defender before falling at the feet of Crone on the edge of the area and his effort found its way through a crowd of players into the bottom corner of the net. Common then looked most likely to add to their tally, with Smith seeing a dipping effort tipped over the crossbar before Hole rattled the post following a turn in the area. Although the hosts rarely threatened in the latter stages, Common saw out the seven minutes of injury time to secure three priceless points. Common: Cruttwell, Paul (Smith), Parsons, Winter (Walker), Maynard, Eldridge, Saville, Tate, Hole, Crone (Richardson), Ellis. Southern Combination League Division One top half (played-points): 1 LITTLE COMMON 31-82 (+74 goal difference), 2 Langney Wanderers 31-75 (+63), 3 Lingfield 30-67 (+56), 4 Ringmer 32-61 (+31), 5 BEXHILL UNITED 31-52 (+20), 6 Mile Oak 30-51 (+13), 7 Wick 29-50 (+28), 8 Hailsham Town 29-42 (0), 9 Selsey 29-41 (+2).